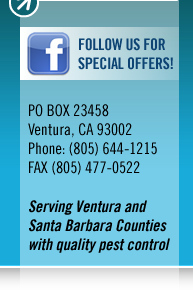 Termite inspection and escrow reports from Shoreline Pest Control in Ventura and Santa Barbara counties. Our job is to help you protect your home or investment by professionally inspecting your properties. We inspect your home or business for signs of termites, fungus as well as informing you of precautions in trouble spots of future infestations and infections. We issue you a full report listing our findings and recommendations, along with the costs to treat and repair the necessary areas. Escrow inspections are one of the specialties of our business. After a full and thorough inspection, your report is then delivered to you and your escrow company. We hold ourselves to a higher standard and complete our repairs with a higher quality than you'll find elsewhere. We manage our own carpenters with years of experience in repairing all types of termite and fungus-damaged wood.